I’ll be honest, I am surprised that I am writing this post. But I have been living in Paris as a digital nomad for the past 5 months. I expected this city to be much more expensive than living in South East Asia; but I have actually been surprised with how much it does cost to live and get around here. If you have seen most of my other posts, I generally say that you need to have an income of approximately $2,000 USD per month to get by comfortably in a country. I achieved this mainly by getting writing jobs. I have provided a guide in my digital nomad ebook for $10. I want to share some insights into what I’ve learned with life in the ‘City of Romance’. And why you shouldn’t dismiss Paris as a place where you can base yourself as a digital nomad. You can stay in the country for up to 3 months on a tourist visa. You will need to check the visa regulations for your country. But if you hold a passport from a country that is a member of the European Union, then you can travel for 3 months without any issues and if you decide to stay longer, you just need to notify the local town hall. If you decide that you want to stay in France for longer than 6 months during a 12 month period, you will need to register as a resident in France for tax purposes. If you hold a passport from a country that is part of the Schengen nations, then you can stay in France for up to 3 months (and within the European Union). If you want to stay longer, you will need to apply for the appropriate visa. Other countries will need to obtain a visa to enter France. You can find out more information by visiting the French visa website. If you stay in the centre of town, most places are within walking distance. The city centre isn’t very big. You can get from one side to the other within a couple of hours simply by walking. Should you decide to stay in the centre of Paris, you can just choose to walk to your destination rather than spend money on public transport. You can even hire the bikes (or purchase one of your own) to get around Paris. Public transportation is relatively inexpensive. If you purchase a day pass for the metro, it will cost you a lot. But if you buy it for a long period of time (e.g. 1 week, 1 month), the price is much cheaper. The prices from Savigny-Le-Temple, which is in the suburbs of Paris were. 22.00 Euros for a weekly pass. 80.00 Euros for a monthly pass. You can find out more information about train passes by visiting the SCNF website. There are affordable accommodation deals in the centre of Paris. This is the bit that I couldn’t believe and that always deterred me from considering Paris as an option to stay. If you are happy to stay in a studio or one bedroom apartment, you can actually have a place from approximately $1,500-$2,000 USD a month. This will usually include all of the bills and expenses. If you would like to opt for a private room instead, you can find places for slightly less than $1,500 a month, but I would actually opt for an apartment. If you are travelling with another person (or two), you can split the cost even further. So then you will only be paying $500-750/month. I’d recommend taking a look on AirBnB and looking at long-stay options (30 days or more) so you can take advantage of any discounted rates. You can also opt to live in the suburbs of Paris and commute in. This is another viable option if you want to save a bit of money and if you want to experience more of the authentic ‘French way of life’. You can live within a 1 hour commute to the centre of Paris. Depending on where you live in the suburbs or in the countryside, you will be able to visit farms, forests or rivers while enjoying a tranquil setting. I did this by staying in the suburb of Savigny-Le-Temple, which is 45 minutes outside of Paris on the train. The town is located next to one of the biggest forests in France and is home to various farms. It is a nice escape from the city centre. 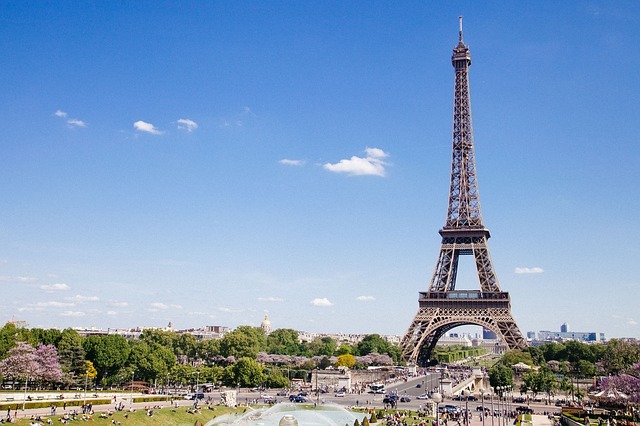 If you aren’t a French resident, you will need to get travel insurance. I cannot stress this enough, but you need to get travel insurance to make sure that you are covered during your stay in France. I purchased mine through World Nomads and the cover for myself worked out to be approximately $100 per month. One way you can get around this is if you have complimentary travel insurance with your credit card or bank and you can demonstrate that you have a return ticket to your country. In my case, I arrived on a one-way ticket, so I couldn’t take advantage of this offer. If I did have a return ticket, then I definitely would have gone with this option. The cost of food at home. If you shop smart at the local supermarket chains like Carrefour or Auchan, you can get food for a relatively inexpensive price. Purchase your food items in bulk whenever you can. I’d say that I was spending between $70-100 a week on groceries for 3 people. But this was because I was focusing on a healthier diet that involved eating meats and green vegetables. To give you an idea about how cheap you can get food in the supermarket. 10 loaves of baguettes can cost you less than 5 Euros. 1 whole chicken can cost 5-8 Euros. 600g of minced beef can cost about 6 Euros. Oven pies/tarts cost around 2.50 Euros or more. Fruits and vVegetables can cost around 1-3 Euros a kilogram. Ultimately, you will need to be smart about your shopping. I would have liked to have found some markets where the produce can be bought fresh and for a bit cheaper, but I found the prices at these supermarkets to be relatively fair. Surprisingly, eating out wasn’t as expensive as I thought that it would be. In Australia, a cheap meal for 2 people will cost around $50 and I found it to be about the same in France. However, you can eat even cheaper if you look around. (I’d recommend taking a look around St. Michel and Bastille). You can eat out at a nice place for a relatively inexpensive price if you can find restaurants that offer a formula (meal deal). So you might end up paying about $20-30 for a three-course meal. If you want to go for a cheap and cheerful option, you can easily find a crepe place that will provide you with a filling crepe for 2-5 Euros. There are also some cheaper restaurants/food places that offer meals for around 5 Euros. Exploring Paris, France and Europe. There’s a lot to see and do while you are in France. Whether you just want to explore the city, visit other French cities or even explore its neighbouring countries, you can easily jump on a train or bus to see the country. Try to purchase tickets in advance so you can get cheaper deals. Consider either travelling by bus, train or even hiring or purchasing a car during your travels. You can then sell the car at the end of your trip and recoup the money that you bought it for. You can choose to work from home, in a café or in a co-working space. There are several options where you can do your work in Paris. One day, you might decide that you want to work in the local café. The next day, you might want to work inside the library of Georges Pompidou. Or you can simply work within the confines of your accommodation. It is up to you. But it is affordable to stay and travel in Paris. What are some of the cool things that you can do while in Paris? Here’s a list of things that I enjoyed while staying in Paris. See the Castle of Versaille. Eating traditional French food at different restaurants. You can even get inspired from ideas in Timeout magazine. For more extensive details about things to do in Paris and France, get the France Lonely Planet travel guide. Hopefully, this post has been helpful. If you have any questions or if you would like to share any travel tips, please let me know in the comments below.